Some of the most important stalled defence deals, may get the “green signal’ during the Putin-Modi summit. A set of defence collaboration agreements are being finalized for signing at the India-Russia annual summit to be held alongside the BRICS summit, on October 15 and 16. India plans to sign several big-ticket defence deals with its traditional and strategic partner Russia during the annual summit between Russian President Vladimir Putin and Indian Prime Minister Narendra Modi on October 15-16, coinciding with the BRICS summit, in Goa. 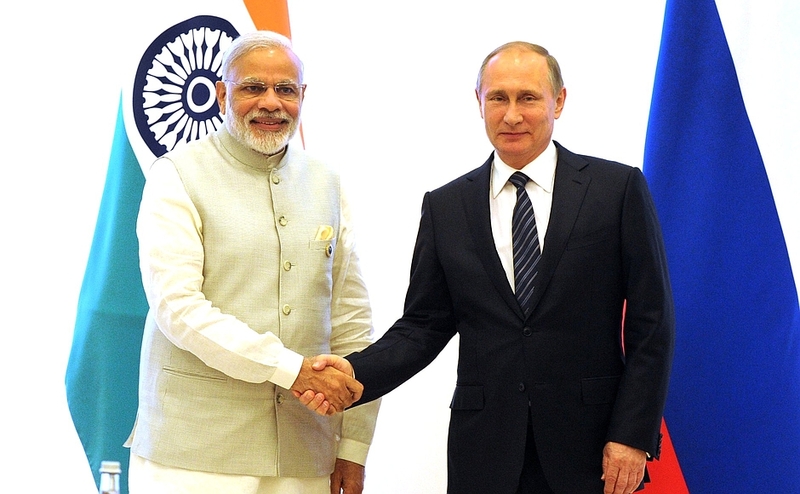 This is the third annual bilateral summit between Putin and Modi. The defence deals, worth billions of dollars, have long been discussed between the two countries. Officials are expediting the exchanges to ensure some agreements are ready for signing at the Goa bilateral summit. According to sources, some of the most important stalled defence deals, may get the “green signal’ during the Putin-Modi summit. These include purchase of five S-400 ‘Triumph’ long-range air defence missile systems, worth $6 billion, an IL-78 multi-role tanker transport by India, the joint upgrading of the Sukhoi Su-30MKI fighters and Kamov-28 helicopters. The projects most likely to be finalized during the summit also include the long-awaited joint development of the fifth generation fighter aircraft (FGFA) worth over $20 billion, and the joint production of Kamov Ka- 26 light helicopters. India is reported to be still in talks with the Russian side on the purchase of S-400 Triumph air defence systems. It may be recalled that under the chairmanship of Indian Defence Minister Manohar Parrikar, the Defence Acquisition Council (DAC), the highest body that takes decisions on weapons purchasing, had cleared the purchase of S-400 air defence systems from Russia in December 2015. However, Russia is still awaiting the “final go-ahead” from India on the supply of the newest missile systems. Negotiations between New Delhi and Moscow on the deliveries of S-400 surface-to-air missile systems and on some other aspects of military-technical cooperation between the two countries are in progress, Pankaj Saran, India’s Ambassador to Russia, said recently. “There are many platforms for discussions and S-400 is one of them,” Saran said. If the deal on S-400s is signed, it will become the biggest defence deal between the two countries since 2001, when India reached agreement with Russia to buy 140 Su-30MKI fighter jets. India might also become the second country to possess S-400s. Russia signed an agreement with China in April 2015, for the delivery of the S-400s. Russia’s delivery of the cutting-edge missile systems to India, will strengthen its air defences along the borders with China and Pakistan. Discussions on the joint development of FGFA resumed earlier this year, after they were suspended over differences on the percentage of work- share in the research and development content between India and Russia. The preliminary agreement on the joint production of FGFA was signed in 2010, and a final agreement would release about $6 billion for joint development. Following a series of negotiations on technical details over the past few months, the two countries are now ready with a detailed work-share agreement, under which Russia will share new generation aircraft technologies as a part of a deal to produce more than 100 fighters in India. During the two-day meeting of the JWG of the Military-Technical Cooperation in September, Russia submitted a “technical-commercial proposal” to supply India with four multi-purpose frigates equipped with sensors and weapons, including BrahMos supersonic cruise missiles. Under the proposal, out of four frigates, two will be delivered from Russia, and the other two will be built in India. There are already six frigates, including three Talwar-class and three Teg-class frigates, with the Indian Navy. The JWG also discussed the issue of joint production of 200 Ka-226 twin engine multi-role helicopters. The deal on joint production of the Ka-226 helicopters in India under technology transfer from Russia, was signed during the visit of Prime Minister Modi to Moscow in December 2015. Sources said 60 helicopters would be supplied for assembly in India, while the remaining 140 will be manufactured in India. It is the first major project to be implemented under Indian government’s “Make in India” programme. The contract is estimated to cost over $1 billion. Russia and India have agreed to incorporate a new company in October for the joint production of Ka-226 helicopters, and the deal is expected to be signed during the coming summit, in Goa. Who needs to down the FGFA? Media reports in September also indicated that India is also interested in leasing a second nuclear- powered submarine from Russia. Negotiations for leasing another Akula-class submarine for about $1.5 billion, are already in the final stages. India’s only nuclear attack submarine, INS Chakra, was also leased from Russia in 2012 for 10 years for a price of $900 million. India is interested in a different and newer class of vessel. Officials have expressed hope that a deal may be signed very soon. Russia is also assisting India in building its indigenous nuclear submarines. The two countries have also made significant progress in the negotiations for the modernization of Su-30 MKI multi-role fighters and an agreement is planned to be signed very soon. Discussions have been going on for some time for upgrading the aircraft which was called “Super Sukhoi,” but the talks gained momentum recently in the run up to the Putin-Modi summit in Goa. The cost of the deal, in the range of $7 to 8 billion, is yet to be finalized, sources said. The military-technical cooperation between India and Russia is as an important pillar of the “privileged, special strategic partnership.” It is not merely a relationship of a “buyer and seller,” but works on complex joint research, designing, development and production projects, with participation of the Indian public and private sectors, and licensed production in India, thereby advancing the ‘Make in India’ programme.